18,000 minutes. 300 hours. 12.5 days. 200 episodes. Running Man reached a milestone this past week as they aired their 200th entry, or as I refer to it as their 200th edition of super awesome amazing funny happy unicorn rainbow pow high jumping television. I know, I know. I should stop trying to make everything into a Japanese game show (I can’t help it, really. I have a problem)! In honor of this milestone (and because there is little to no Running Man news this week) I thought it might be fun to take a look back at the past 200 episodes and highlight some of the gems (in my humble opinion). Feel free to make recommendations of your own in the comments, I think all Running Man fans have those episodes that they absolutely adore (and mine may be different than yours). Cheers! Listed in order of air date. WATCH THESE! If you want, not trying to force you or anything. I am really bad at confrontation…. Speaking of the Stone Cities Running Man Episode Guide check the page out for more detailed information on the episodes listed below. Cheers! Queen Hyori and Jung Eum are the guest stars, Kwang Soo was introduced in a down pour, and Gary ripped the first name tag in Running Man history. Take a look back at where it all began. Monday. Couple. Titanic. Nuff said. Prepare some tissues because this is the saddest episode of Running Man…well, ever. Joong Ki says goodbye and there is some crying involved. The beginning of this episode makes it. Trust me. Choi Min Soo is a scary, scary man. Episode 74 * Super Powers! I am a sucker for the super powers episode, the first entry in the series is hilarious (and sets the precedent for all super power jokes to come). Yes, that is a real scene from this episode. 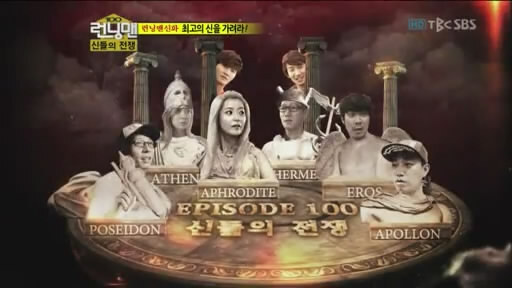 This is by far the strangest episode of Running Man I have ever watched. I am not sure if the PDs took some LSD before this or if they just went for the first thing they picked out of a hat, but man is this one entertaining and strange hour and a half. What is now a Running Man staple was once a Running Man first. Watch as Park Ji Sung and the cast play in the best charity soccer match ever. Give the cast god powers and set them loose in a shopping mall? Yeah, I am on board with that. Hilarity ensues, complete with YEH jokes. Gary and the Busan F4 get along swimmingly while the cast tries to weed out the snake. Hilarious from start to finish. The cast are super heroes. Avengers super heroes. Against impossible odds – like a martial arts expert with super powers of his own. I think the PDs must have been mad at the cast when they thought this whole thing up. And it is entertaining beyond belief. Good job PDs, good job. Patrice Evra and Maknae FD – I ship them so hard. Seriously. The cast is tasked with building cardboard boats that WILL CROSS THE FREAKING HAN RIVER. Their teamwork is amazing and inspiring. And tearful. Dang it – I have allergies okay! Marking the casts 3rd time at the event, this episode is no less exciting than the first. There is just something about the cast of Running Man playing with a bunch of professional soccer players that cannot be denied. So which episodes make your list? Do tell! Jong Kook looked way better doing that dance than he should have. It was super awesome. Episode 163- agree a must watch!!! Omg U just realized that I have not seen episode 100 yet?!?! How did this happenxD other than that one you pretty much got all my favorites here especially ep 74! Episode 74 is amazing! Love the birth of the super powers concept! i love episodes with college students and the ones sent by fans (gwangsoo’s fan and hongkong fan). i hope they do more of this kind of episodes. Episode 182 (Irene the fan girl) and episode 165 (Kwang Soo’s fan girl) are hilarious! I recommend these as well. I also hope they do more of these episodes in the future, fan based challenges are the best! It is so weird…but I cannot look away.